I really liked this story. It's well written, has a great and suspenseful storyline and has one of the coolest familiars I've come across (the demon duck in 'A Nameless Witch' by A. Lee Martinez is even cooler, but that story isn't as good as this one.) I must confess at this point I pictured Sparky (the familiar) as a small Komodo Dragon, which is one of my favourite animals. Voodoo Bride wants me to tell you that she wasn't very happy with the romance in the book. She didn't feel Anya had any real connection to either one of the love interests, but I told her that's because of some emotional issues Anya has so it fits in with the story. Well, just read the book to see if you agree with me or Voodoo Bride. Even without a convincing romance storyline, it's well worth the read. Because it has Sparky, the cool familiar! And because it's a very well written and engaging Urban Fantasy. Ah, that will please Voodoo Bride! I myself am looking forward to Dark Oracle. That one sounds really cool! Thanks! If you like the X-Files, weird science, conspiracy theories, or the Tarot, DARK ORACLE will be a fun read. I wrote that book literally with a deck of cards in hand, so it was bit of a strange writing process. I so must go pre-order now! I've only read one urban fantasy book and didn't like it much, so I'm not sure if it's my thing. But this one sounds good. There's lots of different Urban fantasy out there. There's heaps of UF books I don't like either. I could advice you to try out some UF writers/books. 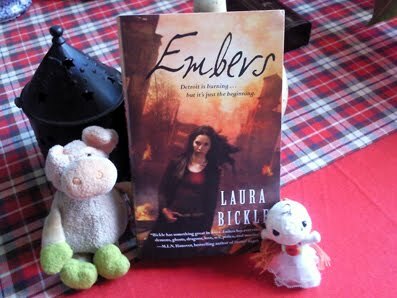 I can really recommend Embers and Mind Games (by Carolyn Crane) when it comes to recent releases as both are very a-typical and unique UF stories.